Caught On CCTV – Man Gets Struck By Lightening TWICE In One Minute. You have a better chance of winning the lottery than you do getting struck by lightning. But tell that to this man, who was struck by two bolts of lightning, just seconds between one another. 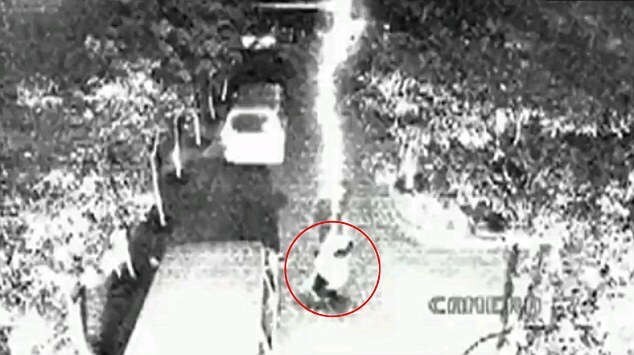 The pedestrian had been jogging along a city street when CCTV captured the astonishing moments when he was struck. The heavy bolts of lightning rips down from the sky and stops the man in his tracks. He stumbles just a few feet before collapsing painfully face down onto the ground. You can see for a few seconds, he was motionless. He then begins to move and finds the strength to stand up on his feet. But then, just seconds later he is struck again. Thankfully, the man pulls himself to his feet and manages to walk away. The community is absolutely shocked that this unlucky man managed to survive 2 lightning strikes. The chances of being struck by lightning once in a given year is about one in 700,000. The chance of being struck twice within such a short space of time are virtually unmeasurable.